Dubai – United Arab Emirates, April 30th 2015: INDEX Conferences and Exhibitions and INDEX Healthcare Management – members of INDEX Holding signed Two MOU’s today with Tunisia Economic City; a mega size project that will occupy more than 90 Square kilometers on the eastern Tunisian shoreline. 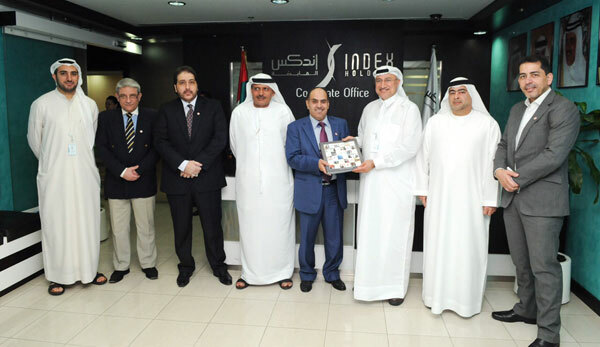 The MOU signing took place at INDEX Holding premises at the Dubai Healthcare City in Dubai. Dr. Abdul Salam Al Madani, Chairman of INDEX Holding signed two MOU’s on behalf of INDEX with Dr. Riadh Toukabri, President and Founder of Tunisia Economic City. The signing ceremony took place in the presence of H.E. Adil Al Otaiba, Chairman of Amplex Capital and H.E. Khamis Bu Amim. The Tunisia Economic City project includes the development of an existing airport in the area, building a port for trading, building and industrial eco-friendly city, a large convention center, Residential area, an academic city, a healthcare city in addition to a media city and a lot of other facilities and services that will contribute to raising the Tunisian economy and create job opportunities for Tunisians. The MOUs indicate that INDEX shall provide comprehensive consultancy and management services in addition to provide designs and listing the rules, regulations and licenses for the “Healthcare City” and the “Convention Center”. INDEX possesses a vast experience in the healthcare industry including hospital management, consultancy, providing innovative and integrated solutions in addition to its vast experience and presence in the Meetings Incentives Conferences and Exhibitions (MICE industry) which will help in boosting the healthcare industry as well as the events industry in Tunisia. Hence INDEX will contribute to the flourishing of medical tourism and developing innovative pharmaceutical products while managing and promoting the available investment opportunities in Tunisia.